Who knew such a simple little clip could be so useful? My love affair with curtain clips began when we were moving into our studio space a little over a year ago. We were hanging curtains up over all the main floor windows, and I remember someone mentioning that they got annoyed by how difficult it was to open curtains that didn’t have curtain rings. You know, the kind that you slide the curtain rod through? I hadn’t thought much about it, since the windows at my house all have blinds, but I agreed that those kinds of curtains could be a nuisance. Shortly after that, Kaitlyn came back to the studio with a pack of curtain clips so that we could make our standard curtains easier to open and close. We all loved them immediately, and I’ve been a big fan of curtain clips ever since. In fact, I like them so much that I’ve been coming up with more ways to use them around our studio, and I thought I’d share that list with you today! So without further ado, here are 10 creative ways to use curtain clips around your house. Use 4 curtain clips to weigh down a tablecloth. Clip one onto each corner of the tablecloth, and the weight will help keep your tablecloth from blowing away in windy conditions! Thread several curtain clips onto a curtain rod or tension rod to create a quick and easy gallery display. Clip up photos, moments, or your kids’ artwork to put them on display, and change them out as often as you like! Pairing curtain clips with tension rods can work wonders in your closet, too. Clip up hats, clutches, belts, shorts, and even boots! Add one or several more layers of storage space to your closet quickly, without making any permanent adjustments. Curtain clips can help add additional storage to a small bathroom. Clip up headbands, brushes, necklaces, and hair ribbons, and hand the curtain clips from Command hooks or a tension rod. It always seems like there’s never enough space for everyone’s stuff in the shower. A simple way to solve this problem is to add a tension rod across your shower and thread it with curtain clips. Clip up loofahs, washcloths, body brushes, and more. Not only will it give you more space, but hanging your shower things will help them dry out quickly rather than becoming mildew-y. Keep your gift wrapping supplies handy by hanging them up with curtain clips! You’ll be able to see what kinds of wrapping paper you have on hand, and you’ll always have your scissors, tape, and ribbon at the ready. Use curtain clips in your pantry to hang spice packets and mixes. You can also hang bags of chips, pretzels, and other snacks to keep the out of the way. 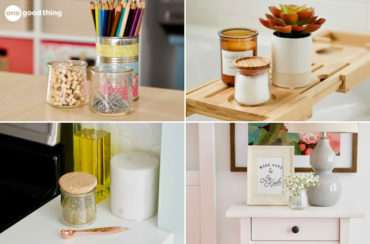 Organize crafting supplies. Curtain rings make a great way to hang up paint tubes, fabrics, tools, cutting mats, and other craft supplies that are usually crowded into a drawer somewhere. Create a custom sign or wall display using curtain rings. Print or cut out letters for your last name or a favorite phrase, and clip them up with curtain clips. Hang the clips from Command hooks or a tension rod, and change it up whenever you like. Curtain clips are obviously a great way to hang your curtains, and it also gives you the freedom to experiment with different looks! Try creating pleats at the top edge by pinching the fabric together and attaching the clips at the gathered points. You could use curtain clips slid over kitchen pulls, to hold recipes……………….I have a rod hung under my china hutch (between the sides) with curtain clips holding photos (back to back, as I have a mirror behind) that way it holds two photos which you are able to see…………………………. Great ideas!!! I like to pick these up when I see them at garage sales. I think they would make great napkin rings, then you could put a place card in the clip. But I have not tried that yet. I like how you can find them in white, gunmetal, and bronze-ish colors. I look forward to seeing your posts in my inbox! Thanks for adding the printer friendly option that so many have asked for! Keep the great tips coming!! I’ve never seen a clip like these. Where would I buy them? I just purchased them at Walmart. Very reasonable with sooooo many uses.